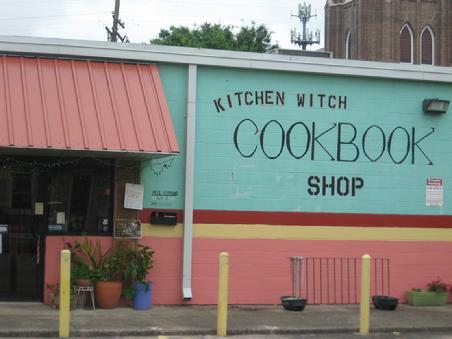 When my daughter Kara was married in 2014 in New Orleans, I knew that after the wedding I would be going to Kitchen Witch, the iconic all-cookbook store. It was, and still is, my goal to visit all the cookbook-only establishments in the country and blog about them. The ones I have visited so far have all been amazing, but none have the funkiness of Kitchen Witch. It’s New Orleans, after all! It’s one of those places you walk into and start by giggling because it’s just fun to look at, but oh my – the cookbooks! This is Kitchen Witch as it is today. When I was in New Orleans last, it was at another location. It may look different on the outside, but the inside, thank goodness, is still the same. I can’t tell you how much fun it is to explore. There is something around every corner. 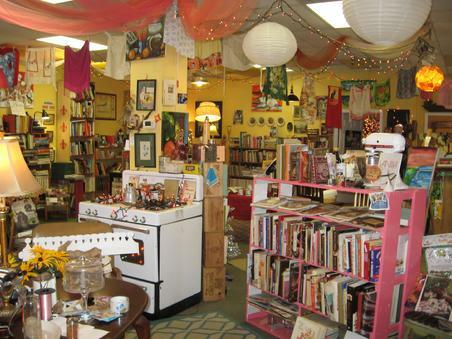 Like I said, there is no other cookbook store that looks like this! 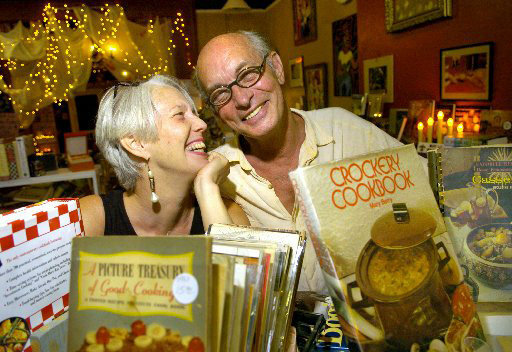 Here are the fabulous proprietors of Kitchen Witch, Debbie and Philipe LaMancusa. Lovely, caring, accommodating, and all around joy to be around. You can tell the moment of entering the store how much they love what they do, and love their customers. I have a fellow cookbook friend named Madonna, who visits New Orleans often and heads right to Kitchen Witch. 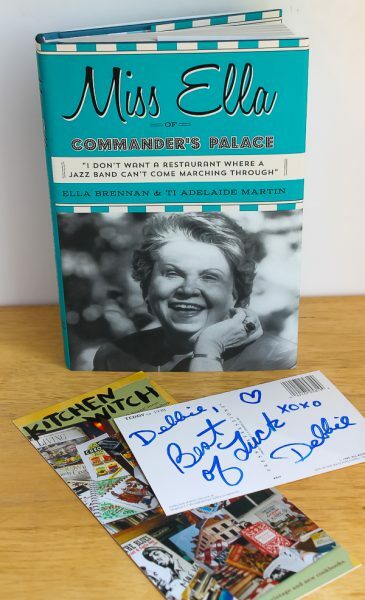 On one of her visits and while chatting with Debbie, Madonna mentioned the flood of my Culinary Cellar and losing almost all my cookbooks. Debbie immediately gave Madonna a cookbook to help the rebuilding of The Culinary Cellar. And what a book it is! 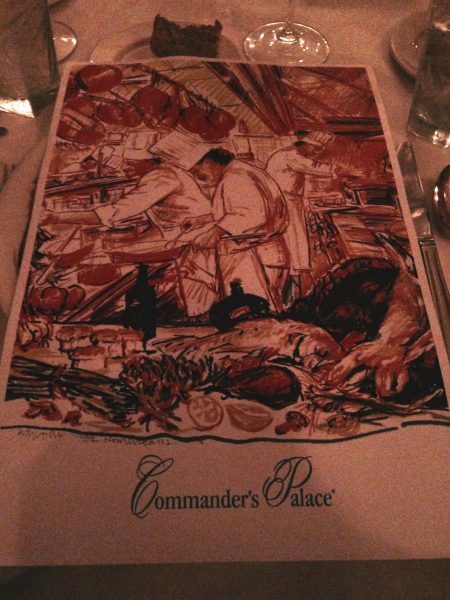 Ella Brennan of the iconic Commander’s Palace was one of America’s most celebrated restauranteurs. She was in a male-dominated world and with her strength, iron will, and love of food, developed an award-winning restaurant with award-winning chefs (Emeril Lagasse, Paul Prudhomme! ), but always wanted her guests to “have a blast” while dining at her pride and joy. Ella’s career began in the 1940’s and went all the way to last year up to her death. I could not possibly say how much there is to know and learn from Miss Ella, so find the book and read it. It’s fascinating! And guess where you will find it, or where it can be ordered. No- not from Amazon, but from Kitchen Witch of course! If a copy of it is not already in the store, Debbie or Philipe will find one for you. Here is Ella’s iconic and beautiful restaurant. 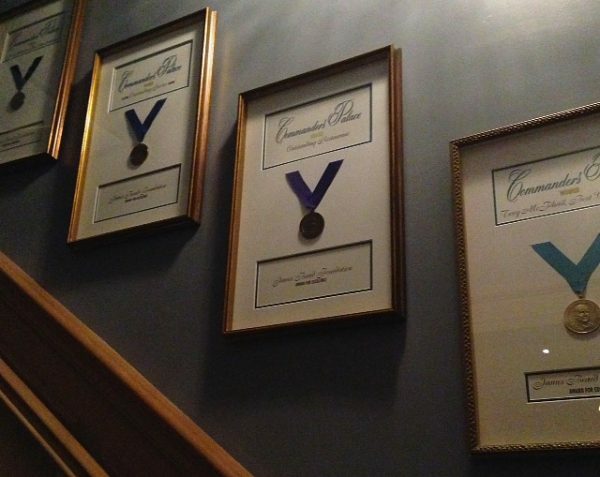 Look at all the James Beard Awards from over the years! This is the menu cover from our visit to New Orleans for our daughter Kara’s wedding rehearsal dinner, which she had framed and now hangs in her kitchen. 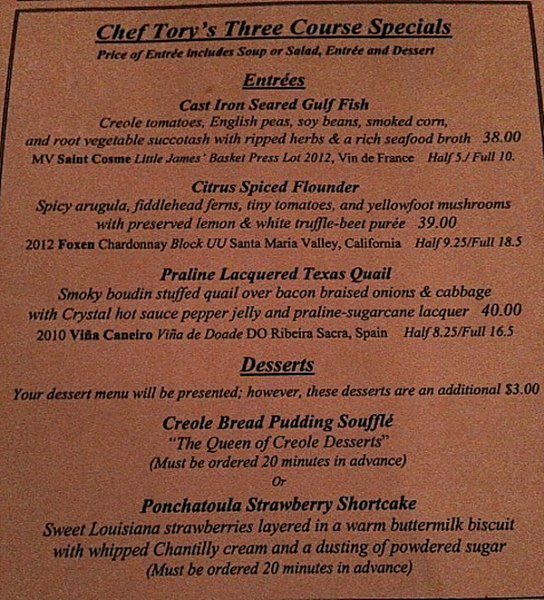 This was our special menu for the rehearsal dinner. I don’t need to tell you how fabulous it was, the food and impeccable service. 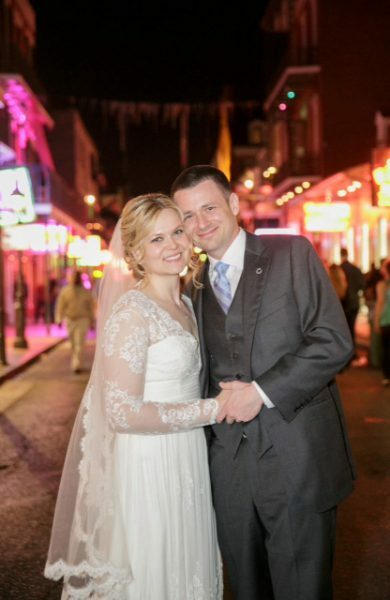 Our happy couple on the streets of the French Quarter after their New Orleans wedding. 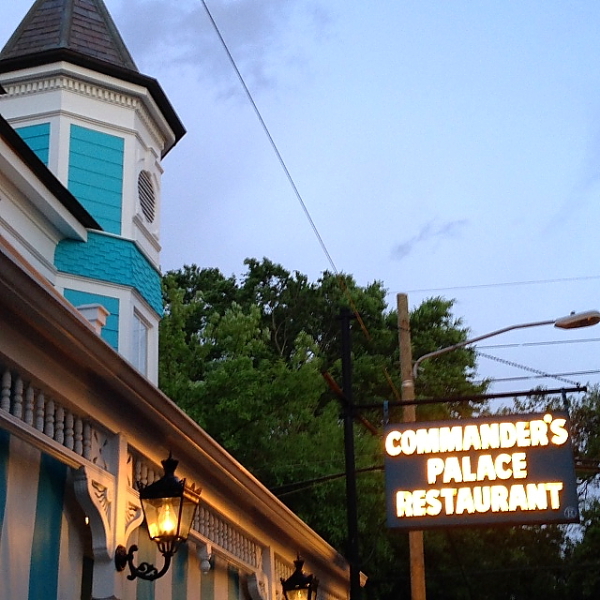 They are so lucky to live not too far from New Orleans and can dine at Commander’s Palace often. As you can see, Miss Ella and Commander’s Palace have made countless people happy and well-fed for decades. Be sure and buy the book and read more about the life of Miss Ella. And be sure to drop in on Kitchen Witch and meet Debbie and Philipe. I can guarantee you a good time and walking out with an armload of books. Also remember to support cookbook stores and all independent bookstores. The world would not be same without them. Thank you, Debbie and Philipe! I hope to see you again soon. Happy 9th Anniversary to The Culinary Cellar!